Simple Logic. Because te should probably read the libretto of your first mostra before te make the sequel. Wallpaper and background images in the Il fantasma dell’Opera club tagged: lnd raoul Phantom opera prologue alw. lol never thought of that! If you're a troll. Ur doin it wrong. If you're just an idiot, you'll fall for THIS! The sequel idea, as far as I'm aware, was starting to get tossed about by ALW in the mid/late 90s. I realize the picture of the Prologue is from the 2004 movie, but that's only because I couldn't find any stage pics of Old Raoul. The date 1905 comes from the original libretto of POTO which is contained within George Perry's the Complete Phantom of the Opera, as well as the booklet that came with each and every double cd of the original stage cast. Now, the stage date of the Prologue has apparently been altered over the years to 1911. 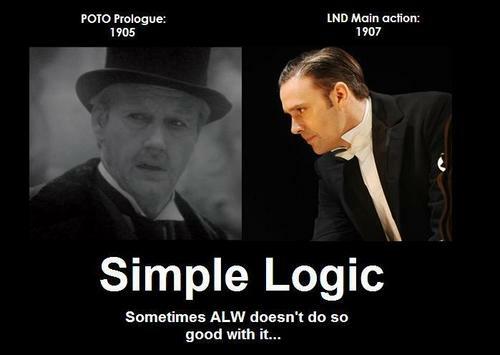 However, that's still only 4 years after the action of LND, and therefore still makes no sense. We see Raoul being perhaps 40 at MOST in the sequel turning into a 60+ year old man four years on. Even if you take Old Raoul with the movie time line, the film was set in 1870. That's a good deal more than a ten year difference to get to 1907. The short version of all of this is that ALW needs to pick a damned date and stick with it, and learn to do simple math. They also have in the prologue on Christine's grave that she died when she was 63, as far as I know Christine was 17 or 18 during the stage musical/movie and Love Never Dies takes place 10 years later which only makes Christine 27 or 28 when she dies. HAHAHAHAHA!!!! THAT IS MY FAV PIC EVA!!!! !